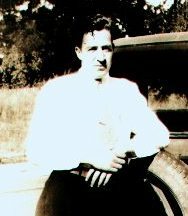 Loren Adelbert Jones Sr. was born on June 4, 1913 in Anacortes, Skagit County, Washington to George and Bertha (Potts) Jones. Loren served in the Army Reserve (Battery A, 248th CA (HD) on April 15, 1930 and was discharged on June 7, 1932 to enlist in the US Marines. On 7 June, 1932 Loren enlisted in the US Naval Reserve in Seattle, Washington and was Honorably discharged on 6 June, 1936. He again volunteered for duty in the Naval Reserve in 1947 and was honorably discharged in 1950 as unfit for active duty. Loren married Verona Ludington, daughter of Harvey S. and Gertrude (Gilbronsen) Ludington on 19 December 1934 in Seattle, King County, Washington and they had three children. Frederick, b/7 July 1936, Verona - b/1 June, 1937 - d/12 December, 1938, and Loren Jr. - b/22 October, 1939. Loren worked for the WPA during the depression years and then was hired at the Naval Shipyard in Bremerton, Washington. Loren retired honorably as a Blueprint Shop Foreman in 1972 with 32 years of service. Loren was a member of the Bremerton Elks, Past Trustee of the Bremerton Eagles, Board member of the Peninsula Pacers Radio Club. He and Verona were members of the Good Sam Travel Club. They enjoyed "getting out and away" in their motor home gardening and their grandchildren. Military Records, Birth certificates, marriage certificates, civil service papers in the possession of his son Fred.